They say all good things must come to an end and unfortunately for fans of the NBC series Grimm, that is the case. Currently airing its sixth and final season, Grimm will end its amazing run much to the dismay of fans around the world. The series has been a solid performer for the network its entire run and has introduced the world to creatures like Hexenbiest, Blutbaden and Siegbarste. One of the reasons for the success of the series is the work of actress Bitsie Tulloch. Bitsie has certainly shown over the course of the series that she can handle anything the writers of the series throw at her. From Juliet, to evil Juliet and now Eve, her versatility has been a major asset to the series. We sit down to talk with Bitsie about the final season of Grimm, what she will miss about the series and what she has to say to the fans who have stayed with the series. Pop Culture Principle – What were your initial thoughts when the series order for season six was only thirteen episodes compared to previous seasons? 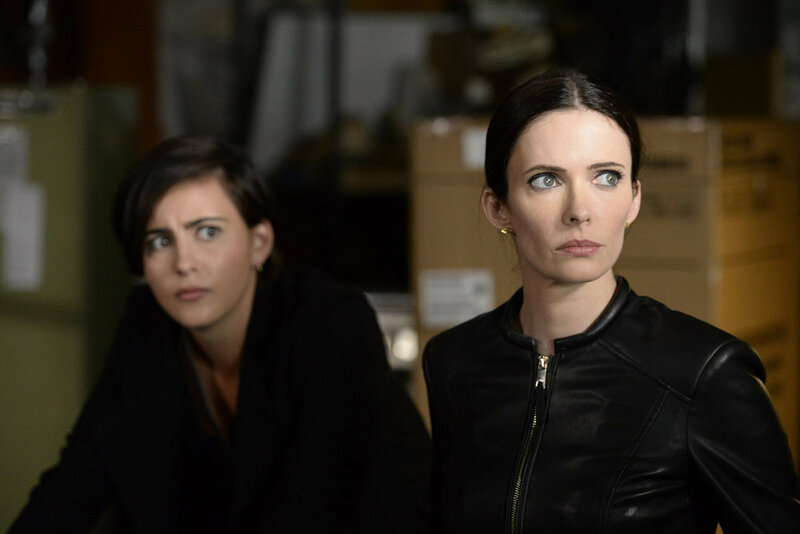 Bitsie Tulloch – You know, a twenty-two-episode season really doesn’t happen that much anymore, so I was so grateful that we have been able to do twenty-two episode seasons through Season 5. I think everybody was a little bummed out because that was also coupled with the news that the series wasn’t coming back. I think we knew before NBC wanted us to announce it, so we were all a bit disappointed. You really want to end this wonderful series on an incredible note, so any sort of time restraint I think is a little bit of a bummer, but the writers did an amazing job with these thirteen episodes. Pop Culture Principle – You’ve basically played 3 characters in your time on Grimm. As an actor, how have you enjoyed playing these characters? Bitsie Tulloch – I actually look at it as four characters in Season 6 because it’s a little bit of an amalgamation of Juliet and Eve, more Eve than Juliet. We started with good, sort of naïve Juliet, then evil Juliet, then this robotic, calculating Eve character and now it’s a little bit of both. I feel really lucky because that is sort of an actor’s dream. We want to play different characters and you want to stress yourself in different ways. When they wrote Eve for me, I was pretty grateful because they trusted me with playing a completely different character from what I’ve been playing. I thought it was really cool. It was certainly a lot harder for me than Juliet ever was, so as an actor, I felt really blessed to have this brand-new character to play, but on the same television show. Pop Culture Principle – Have the other actors in the cast had different reactions playing off of you as Eve in scenes as opposed to Juliette? One of the films Jim and David told me to watch was Nikita and I found that helpful, but what I found even more helpful as far as inspiration and thinking about this character and tackling this character was Ex Machina. Alicia Vikander’s performance was so great and it was so moving in spite of how incredibly robotic it was, so I just sort of found the character over time. Physically, I thought there was a magnet on the top of my head and on top of the ceiling, because I wanted Eve to stand really tall. Our fans are really smart and the only way this was going to sell was if Eve was a very different character and I was very aware of that. Pop Culture Principle – We are starting to see flashes of Eve showing some feelings and emotions. How big of a part will this play for the rest of the season? Bitsie Tulloch – I think when she starts to feel emotions, there is a huge conflict because she doesn’t want to necessarily. She really likes having this new purpose that she didn’t have before she became a Hexenbiest. The feelings, whether it’s for Nick or whether it’s her old friend Rosalie, it’s not welcomed necessarily, so that is part of her trajectory over the course of Season 6 which is reigning it in when it does show its face. Bitsie Tulloch – There is so much focus on shipping which on the one hand is wonderful, because it invigorates the show and there is all this new energy which is great, but on the other hand, is it necessarily the right message to be sending out to our female fans? Is a character’s worth dependent on whether or not that character has a romantic relationship with a dude? When we were at Comic Con, they hadn’t even written Season 6 at the time, and that question popped up, I didn’t even think about it and just said that Eve doesn’t need a man. She is so focused on using her powers for good now because she feels so guilty about all the havoc that Juliet caused. I was also asked what I really wanted for her and I thought it was to make up for causing a lot of grief and heartbreak to other people, inadvertently of course. As actors, we must defend our characters above all else and one thing that I always remind people is that Juliet did this for Nick because Nick wanted his powers back. She never asked for it, she never asked to turn into the evil Hexenbiest and a lot of what she was doing, she absolutely couldn’t control. That being said, it did happen and she did cause pain and heartbreak. I think that is a lot of the reasons that she is so focused on helping out her friends, helping out the Scooby Squad and trying to make amends. Pop Culture Principle – We see that there may be something drawing Eve to “the stick” that Nick has hidden. Anything you can tell us about that and its affect in the final season on Eve? 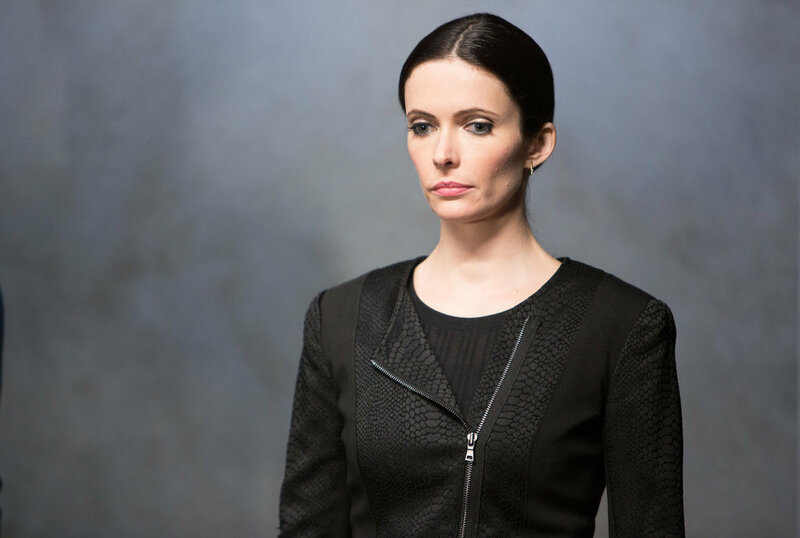 Bitsie Tulloch – The stick comes up quite a bit with Eve’s character in Season 6. I just want to throw this out as a teaser to the fans. Myself and everyone else on the show included, we all sort of thought that the stick was one thing and it ended up being something different. The stick figures very prominently, particularly in the last few episodes of the entire series. When they first wrote the stick in to the scripts, the entire cast was kind of wondering what the writers were doing, but now it totally makes sense. Pop Culture Principle – The final season pits the gang against Renard. How pivotal of a role will Eve have in this battle? Bitsie Tulloch – Not hugely because it’s not really any single person against Renard for this last season, it’s more like the Grimm gang against him. Juliet and Eve have both had some one on ones with Renard over the course of the series, but you definitely see less of that. The last season there is more focus on the team having to work together to defeat this enormous, unfathomable enemy and entity that is the villain of the last few episodes of the series. We haven’t really seen anything that dangerous of course, because it’s the end of the series. Pop Culture Principle – One thing Grimm has shown us over the run of the series is that anytime you use magic or anything like that, there are always repercussions? Would you agree? 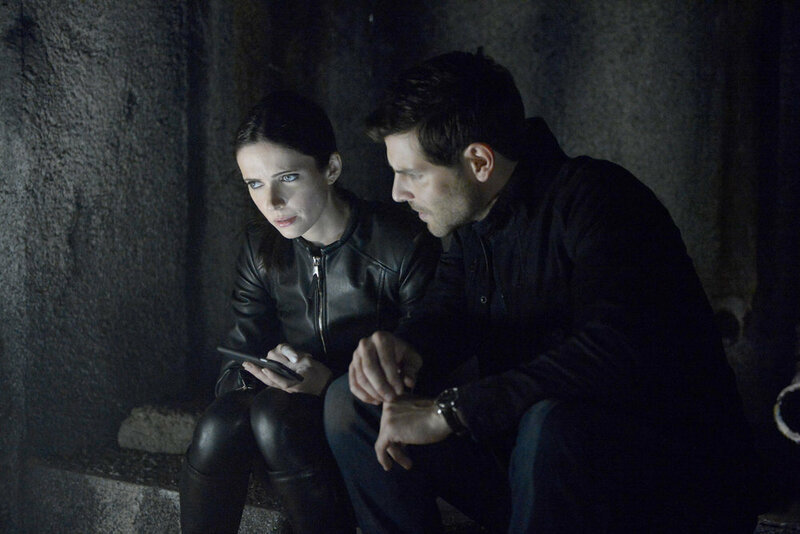 Bitsie Tulloch – Yes, whether they are intended or not is another question which I think is part of the humor of Grimm. You have everyone in the spice shop trying to cast a spell and sometimes the go awry or it’s not quite what you expected. Whenever there is a spell happening, there are some crazy effects. Probably, the biggest one of the entire series was that everybody thought Juliet agreeing to smoke out of the hat in order to give Nick his powers back would be reversible and it wasn’t. Pop Culture Principle – David Giuntoli will be directing an upcoming episode in the final season. What was it like working with him as a director? Bitsie Tulloch – Yes, he did and I was so proud of him because he’d been asking to direct for a while, so we were both really happy that he finally got the opportunity to do that. He’s never been to film school, but he did a wonderful job. They had to write David out of the episode more than he really is because David usually works all day every day, but because he was directing, there is a really funny twist on how they have written David out of that particular episode. I was just really proud of him because he works incredibly long hours and really hard and any time he had a scene off or any break or a rare day off, he was shadowing other directors on set, reading books on directing and taking meetings with a lot of the directors. It really felt collaborative because everyone knew he hadn’t directed before and everybody really wanted him to be successful. Seeing the crew come together in an incredibly collaborative way to make it easy for him and have a successful episode was amazing. He just did a wonderful job. He had amazing energy on set and he was so positive and just great to work with. Pop Culture Principle – Looking back on your time on Grimm, what are you most proud of? What will you miss the most? Bitsie Tulloch – You know, the answer is probably the same to both questions. Every time I work with a guest star or a co-star on the show, they always say that Grimm was the nicest set that they’ve ever worked on and that makes me so proud. Grimm is not an easy show to film. We all work incredibly long hours and it’s often at night, in the cold and in the rain. So, the fact that everybody has been as kind to anyone who comes on to set is really wonderful. What I will miss the most is working with the cast and the crew. David and I are not going to leave Portland because we love it so much here. We are probably going to try and split our time between Portland and LA. Who knows what is going to happen during pilot season you know, we could end up in completely different cities, but the intention right now is to keep a footprint in Portland because from our point of view, it’s just about the greatest city. Portland has been wonderful to the show and the fans have been amazing. Pop Culture Principle – What can fans look forward to with the final season of Grimm? 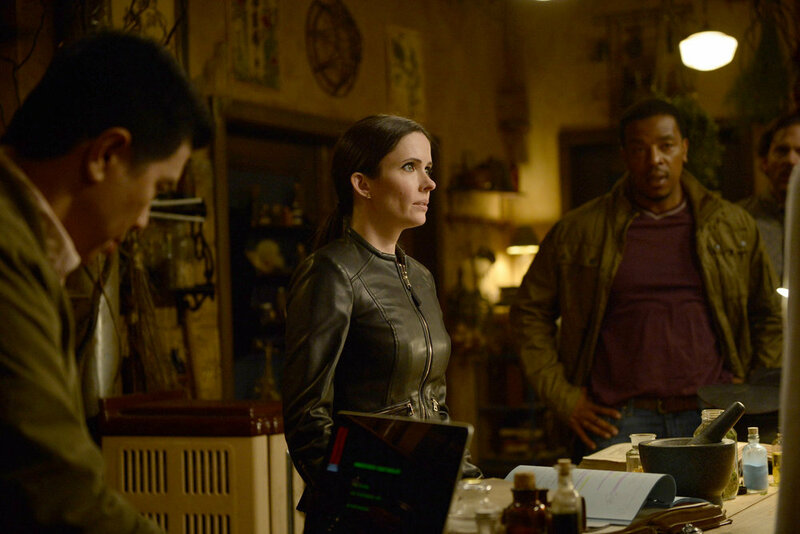 Bitsie Tulloch – Honestly, it’s really just about them wrapping it up really beautifully. Episode eleven of this final season is amazing because of the amazing sets and the production designer of that episode is amazing. There is fire and amazing costumes and I can’t wait for the fans to see it. One of the funniest episodes that I think we’ve ever done on Grimm is the seventh episode. It’s not inspired by the Grimm fairytales as usual, but it’s inspired by a Shakespeare play and it is hilarious. It really feels like a gift to our fans because it’s so amusing and fun and I can’t wait for the fans to see that one as well. Pop Culture Principle – What would you like to say to the fans of Grimm? Bitsie Tulloch – I just want to say thank you from the bottom of my heart. We certainly would not be here, six years later if they hadn’t been so supportive and loyal. The reality is that we’ve moved around to different days and different time slots and the fans still found us. Our ratings were always stable enough to continue getting renewed thanks to the fans. Everyone has been incredibly kind to me and I’ve always been very proactive on social media because it felt like it was a way for me to give back to our incredible fans. David and I started doing conventions so we can get the chance to meet our fans, take pictures with our fans and hug our fans. Obviously, since I am marrying David, the show has changed my life in just the best way, so thank you to everyone who have supported us over the years! First, the Pop Culture Principle would like to thank Bitsie Tulloch and the rest of the cast and crew of Grimm for their tremendous work on the series. Thank you Bitsie for sitting down with us and talking about the final season of Grimm. You can catch new episodes of Grimm every Friday night at 8/7c only on NBC. If you would like to keep up with all of Bitsie's latest news and projects, you can follow her on Twitter and Instagram @BitsieTulloch. You can also like her official Facebook page here.